Definitely a step above its forerunner (pun intended) Uprising, Helljumper is a worthy adventure for Halo fans who liked ODST. Spread across 5 issues, it covers an earlier mission of two of the game’s heroes, Dutch and Romeo. The novel opens with a distress call from an arid human world called Ariel; the ODSTs are summoned to investigate the situation. Landing on the surface of the planet, they’re puzzled by a startling absence of human life, finding only one corpse that seemingly died from fright. Entering the underground facilities of the planet, they happen upon several platoons of Covenant forces, commanded by several relentless Elites. In the violence that ensues, Dutch and Romeo are separated from the rest of their squad and forced to unravel the devious schemes of the Covenant on their own, confronting legions of enemy forces all the while. 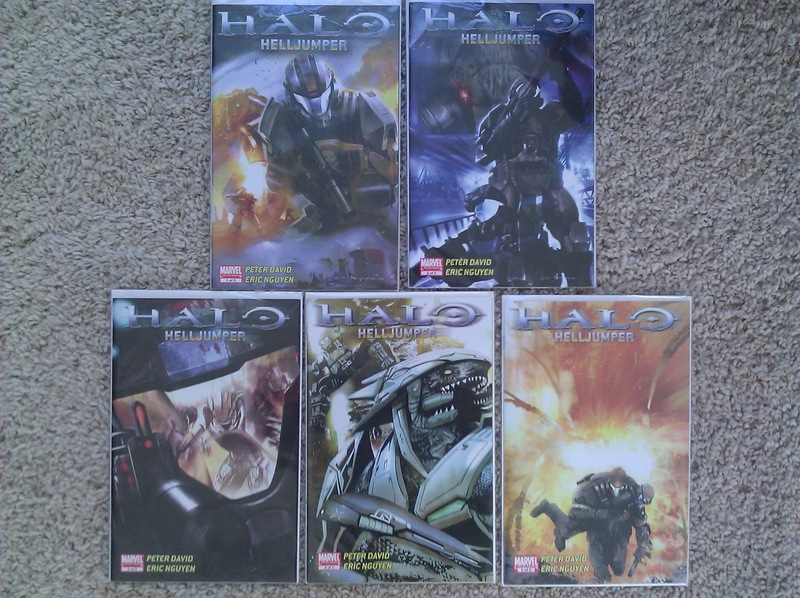 The book’s artwork, by Eric Nguyen, is also impressive, if not completely unique; the ODSTs are drawn well and the Covenant soldiers are exceptionally portrayed as the fearsome menaces they represent in the games. Stronger and swifter than their human adversaries, the Elites are no pushovers in this book, as Romeo and Dutch deduce the hard way. Battle scenes are complemented with a good deal of purple blood and gore, so much at times that it seems excessive, but the intensity of ODST’s combat is captured nonetheless. The book fall short in some areas, the most notable flaw being an awkward subplot involving a relationship between Dutch and a female member of his squad, a relationship so strong it induces Dutch to request withdrawal from the UNSC when his special friend gets injured and has to leave the military. If anything, this functions as a compelling argument against sexually integrated armies. It’s also regrettable that the novel only probes the background of Dutch and Romeo, neglecting to incorporate any of ODST’s other characters, such as Buck, Mickey, or Dare into the plot. Overall, though, Helljumper is a quick and fairly enjoyable read that should be embraced by fans of the Halo universe. It’s not a terrific graphic novel and the $20 retail price is too high, but for $10 it merits a look.